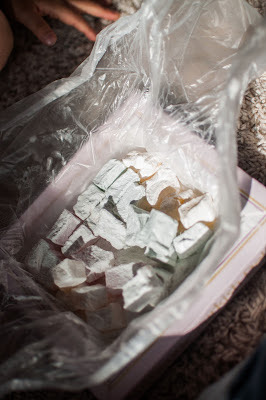 In the past, Bookworm1 and I attempted to make our own turkish delight using this recipe. Several people mentioned that the recipe lacked the key ingredient of rose water. It was definitely lacking something because our batch was a huge flop. No one could stand it. This year I wanted to try Turkish Delight made by someone other than myself. This treat is supposed to be a favorite treat of English children and surely they couldn't like the stuff that I concocted in my kitchen. I figured we were definitely missing something and it was time to figure out exactly what. 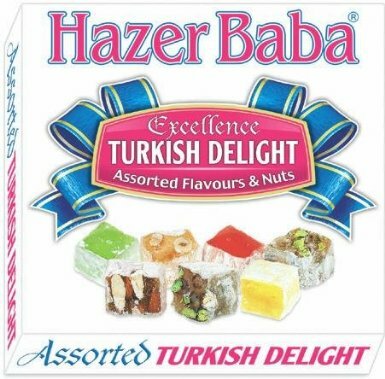 I opted to purchase this box of Turkish Delight on Amazon. The kids and I each get to eat one piece of it every day when we sit down for our read aloud time. (We're reading The Lion, the Witch and the Wardrobe at present.) With a little bit of fear and trepidation, we opened the box, made our individual selections and took a bite. The general consensus? Turkish Delight is DELICIOUS!!! The kids are wildly enthusiastic about our reading time at the moment because it involves CANDY! They grin whenever it is mentioned in the book. I think that's just plain fun. And sometimes you just need to have fun. When I placed the order on Amazon for our box of these goodies, I didn't order just one, but two! I figured if they were half decent I'd share a box with one of you. I think you and yours are likely going to love them and then you, too, can understand why it is that they were always on Edmund's mind. This contest will be open to US Residents only and will remain open through Tuesday, July 30th. I'll announce the winner at the conclusion of the Chronicles of Narnia Reading Challenge. My personal favorite is the rose flavored one but I'm letting Bookworm3 eat most of those. She insists those are hers because they are PINK! How can you argue with that? Also, here's a really weird song on the topic which you can risk getting stuck in your head if you like. THIS CONTEST IS NOW CLOSED. THE WINNER (as selected by Random.org) IS Laura Book Snob. Congrats! I saw some Turkish delight just last week or the week before at TJ Maxx or Ross or some place like that. Why didn't I buy it? I think I anticipate it being gross, so I just don't even consider it. Now I wish I had bought it! Ah, well. Sign me up! You are so fun! I love the idea of eating it as part of the read-aloud time. Regarless, I would LOVE to try this!! I think I had Turkish Delight on my Amazon wishlist at one point. I bought my dad a big box of it for Christmas. World Market generally has Turkish Delight during the holidays. You definitely MUST have the rose water in the recipe. Here in CA, it is really easy to find - Mediterranean stores are everywhere - but you can also make it yourself in a pinch. Ooh, I would love to win some Turkish Delight! I've always loved the hoopla Edmund made over it, thinking it must have been some sort of wonderful. That is so awesome!! What a great idea! I myself have never tried Turkish delight and would love to win. I love to read aloud to my kids and as they get older it is getting harder to do as they are not as interested. Candy is a great way to entice them and to bring the book alive. LOVE IT! PS. I read book #1 The Magicians nephew and just foun the second book at the thrift store yesterday. Yahoo! I would love to try them. After reading about them in several books, I am curious as to how they taste. I've never heard of them. They sound good. Jan W.
I love Turkish delight. Pistachio is also good. There used to be a candy store that would take the rose flavored and dip it in dark chocolate. That was my favorite, and I haven't found it since. I'd love to try it! We've had some success with making it at home, but I'd love to try some "professional" Turkish Delight. How very fun--what a fun mom you are! My kiddos would love this. And while I didn't make the foray into Narnia this month, I did read The Great Divorce which. was. amazing!! I can't stop thinking about it, even though it was a little depressing. Oh I'd love some! And I agree with Bookworm three, I'd like the pink ones too. I am very excited to hear this song. I've wanted to try making some, but maybe it would be best to try the real thing first! Thanks for the giveaway!